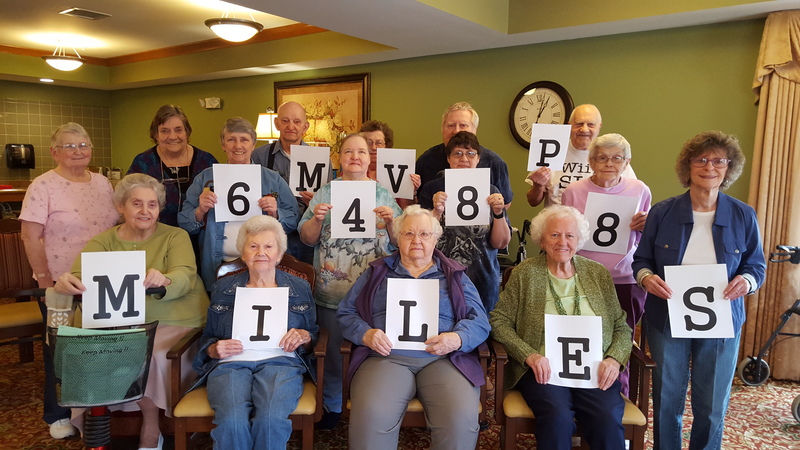 UPDATE: The final results of the Affordable Assisted Living Coalition’s Keep Moving Challenge are in, and supportive living communities from across the state logged more than 70,000 miles during the three-month program. Gardant communities earned more than 50,000 miles – and gave the organization a significant boost in the contest that took participants around the globe nearly three times. Heritage Woods of Charleston logged 6,488 miles and was the winner for supportive living communities with less than 80 units. Eagle Ridge of Decatur won the over-80 unit category by walking 4,304 miles. Mildred Flynn, an 82-year-old resident from Cambridge House of Maryville, walks/jogs around the track, dances whenever possible and incorporates fitness and strength training into her daily routine. MARCH 8, 2016 – Gardant communities accepted the Affordable Assisted Living Coalition’s Keep Moving Challenge, and for the past two months, residents and employees have been finding creative ways to stay active. Residents were initially asked to walk across the state of Illinois, but when they surpassed that target after the first week, the AALC increased the stakes and asked everyone to travel across the globe. They’ve since done that – nearly two times over – and Gardant communities have trekked thousands of miles to help the organization achieve its new goal. In all, communities operated by Gardant Management Solutions have logged 31,000 virtual miles – about 75 percent of all miles earned. 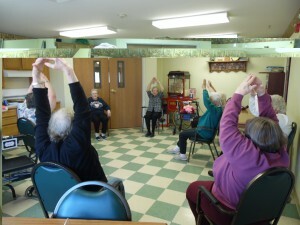 Residents fill the room for weekly exercise classes at Heritage Woods of Charleston. Heritage Woods of Charleston has earned more than 4,400 alone during the past eight weeks. Joyce Baker, who leads the exercise class there, says she’s seen a boost in attendance with about 40 percent of residents participating each week. This active group has been holding steady in first place since early on in the competition. Eagle Ridge of Decatur surged from further down in the pack to capture 2,200 miles and take the top spot in a separate competition among larger communities. They mapped out all of the Decaturs in the United States with a goal of visiting each one. Residents have also earned miles by gardening, walking and attending Step in Time exercise classes. Gardant communities have captured seven of the top 10 spots in each category: the individual contest and the under-80 unit and over-80 unit competitions. 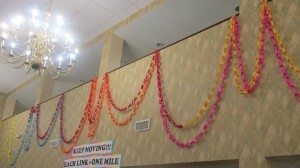 Visual displays at Cambridge House of Maryville motivate residents to keep moving. Each time someone walks a mile, they add a link to a colorful chain that hangs in the dining room. 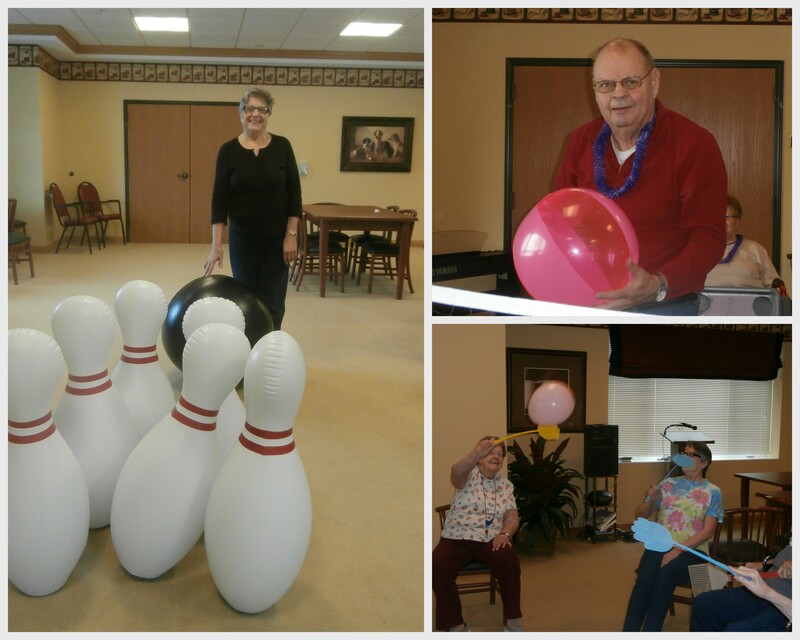 The residents at Heritage Woods of Belvidere are seeking out fun activities to earn miles. They’ve tried jumbo bowling, fly swatter volleyball and beach volleyball. Resident and staff dance parties are also a big hit. At Heritage Woods of McHenry, residents are fighting the winter blues by staying active. Stretching classes and resistance band training are popular activities, and it’s not uncommon to see people counting steps around the building as part of the community’s Walk in the Woods program. Residents track their distance and turn in progress sheets for a chance to win gift cards. Most recently, they have taken on balloon volleyball, said Resident Services Coordinator Janet Michel, which gives them a chance to bump, set, spike, kick, and most importantly, laugh. The Step It Up Walking Club at John Evans Supportive Living has been logging miles, and the community’s Wii Bowling team is gearing up for the AALC Tournament. Residents have joined the adult coloring craze, and they are looking forward to their annual bean bag toss games with staff once it gets warmer outside. Meanwhile, a relaxation and stretching program is the biggest mile booster at Heritage Woods of Watseka. The community has two Wii Bowling teams, a walking club and several other activities that residents can participate in to earn Smart Bucks. This money can be used to purchase items during quarterly auctions at Heritage Woods. For more information about the Keep Moving Challenge, visit the AALC website.